Be sure to also check out our reviews of the best video baby monitors! We gathered 8 moms and dads and 11 different sound-only baby monitors, and put them through comprehensive hands-on testing. Each set of parents tried out 3 different baby monitors in their own home, testing sensitivity to noise and/or movement, clarity of sound, range, ease of use, and reliability. We tested them in big houses, small houses, tall houses, and wide houses, to make sure we got a handle on how reception varies in different contexts. We pulled together all the reviews, compiled the results, and developed our best baby monitor list. Below we list the top 5 audio-only baby monitors, followed by our in-depth reviews. Our recommended baby monitors are the easiest to use, have the clearest sound, and are highly sensitive to baby sound and movement. And they all have decent range. So you can carry the unit around with you in the house and even in the yard, and be confident that it will still let you know when your little one makes a peep. Some have added features, like movement sensors, and others are relatively simple. When finding the best baby monitor for your family, you want to make sure it's also reliable and uses secure communication. All of the baby monitors for this test were sound-only. Here are the Best Audio-only Baby Monitors of 2019! 1. Angelcare Movement and Sound Monitor. This is the best baby monitor of the year, making it squarely to the top of our list, but with only a slim margin above the Philips Avent DECT. The blue pad goes under your baby's mattress and is able to detect even the most subtle of movements. The microphone device detects breathing sounds and any other noises your baby makes, and those are indicated as movement lights on the receiver unit even if you turn off the sound. The system will trigger an alarm if it does not detect anything for 20 seconds; our tester parents who had a premature baby really loved this feature as it reduced their worries during the night. The full color digital display also shows the temperature in your baby's room to give you confidence that it's not too hot or cold during the night. The receiver unit is portable and automatically recharges when placed in the convenient cradle by the side of your bed. Our parents noted that its range was very long, the sound quality was high, and they loved the extra features (temperature monitor, movement monitor). So there are a ton of great things going for this baby monitor. The cons? Some of our parents mentioned that it was a bit complicated in terms of its lengthy feature list, and another mentioned that it tended to false alarm a lot so they had to turn down the sensitivity of the pad. Overall, parents were the most positive about this unit, and by and large had only great things to say. We found it online for about $80. 2. Philips Avent DECT Baby Monitor. 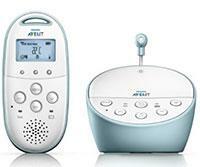 Coming in at #2, the Avent DECT is a fantastic baby monitor with an impressive set of features. While it does not have the movement sensor like the Angelcare, it does have the temperature sensor and a few other great features. First, it has a talk-back feature which allows parents to talk back to their baby to help soothe them back to sleep. Second, it has a lullaby feature which allows you to remotely turn on a soothing little lullaby from the comfort of your own bed. You can also turn on a night light for your baby if you'd like. Just like the Angelcare it has a wireless receiver unit that recharges automatically when placed in the cradle. The range wasn't quite as good as the Angelcare, but many of our test parents noted that the sound was crystal clear and they liked that it used encrypted digital signal transmission to reduce interference and the risk of a neighbor "listening in." Another positive is that you can change the sensitivity of the microphone to ignore the relatively quiet whimpers and only activate for the louder squeals. Overall, this is an excellent baby monitor. If you're not interested in having a movement monitor included, this is our #1 bet. 3. VTech DM221 Audio Baby Monitor. This is one of two VTech baby monitors on this list, and this one comes in above the other for overall features and functionality. In addition to the basic audio monitor functionality, it also includes a two-way intercom (so you can talk back to your baby, like a walkie-talkie), a vibrating sound alert (for when it's muted), a rechargeable battery in the parent unit, and a night light on the baby unit. Like the DM111 (below) it uses the DECT 6.0 technology for digital transmission and white noise reduction. In our testing, there were a few nice things to point out. First, we liked the big loops at the top of the baby monitor and parent unit, making them very easy to pick up and move around. There is also a belt clip on the back of the parent unit, since it's a bit large to fit in the pocket, you can put it right on your hip. Second, we loved the "page" function, which allows you to press the page button on the baby unit, which will make the parent unit beep until you find it (buried in the couch cushion). Third, we also liked the night light, which is nice for brightening things up a bit, for instance when you need to do a night-time feeding or diaper change. Unlike the DM111 (below) you can adjust the volume and sensitivity separately, which is a great feature to reduce false alarms that startle you awake with random pops of static. Finally, the rechargeable battery in the parent unit lasted for over 15 hours in our testing, which was pretty impressive. That means if you accidentally leave it on during a morning nap, it won't be dead by the afternoon. Range was decent in our testing, and it gives a beep to warn you when you're getting too far away (for us, that happened in the back yard). Overall, this is a great baby monitor, and is well worth the price at only around $30. 4. 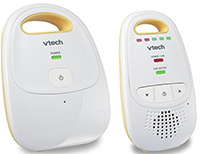 VTech DM111 Audio Baby Monitor. Here is a super simple and inexpensive baby monitor with some decent features and high reliability. 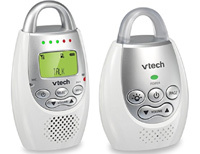 The VTech baby monitor uses the DECT 6.0 audio transmission for high sound quality and lower fuzzy white noise. It is a basic baby monitor with adjustable volume, a sound level beter to indicate how much sound is in your baby's room (even when it's on mute), and the parent unit has a belt clip. In our testing, we thought this baby monitor did a decent job for such a cheap option. It was sensitive enough without bringing in too much fuzz sound (there was a bit of a hum even on low volume), the range on the parent unit was pretty good (it worked upstairs and across the house, and in our small yard), and the batteries seemed to last several hours pretty long when unplugged. What we didn't like was that the volume didn't seem to go low enough, even at the lowest volume the speaker was pretty loud and had this subtle hum to it (which got a bit annoying), and the batteries in the parent unit are not rechargeable. So it eats through AAA batteries pretty quickly, ours lasted only about a week with normal use. Either buy stock in your favorite battery company, or go with a unit that has a rechargeable parent unit. We just leave it plugged in most of the time, so it doesn't use the batteries too much. Overall, this baby monitor offers good bang for the buck for parents looking to get something inexpensive, basic, and reliable. 5. 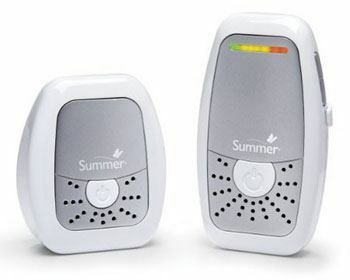 Summer Infant Baby Wave Baby Monitor. If you thought the Graco was simple, then you'll be in for a surprise. This Summer Infant baby monitor is even simpler (and cheaper!). Like the Graco (below), it does sound only and also has a little indicator light that goes from green to yellow to red to indicate the intensity of your baby's noises. Our parents who tested this system were mixed in their reviews. Some of them noted that they got a lot of interference in spite of the system's claims to be digital and interference free. They also noted that the shape is a little awkward to carry and stand on end, and the range isn't quite as good as with our top two options. Overall, this is a decent little unit with some limitations you should be aware of. But for the price, it might be worthwhile? 6. 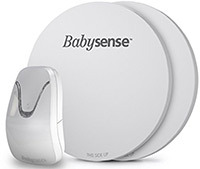 Babysense Hisense 7 Baby Monitor. This unit is a bit different from the others because it doesn't default to tracking sound only and then add a bunch of random features, it's really designed for the parents who are only concerned about tracking movement. This Hisense baby monitor tracks movement only, not the sound of your baby. Using two super thin sensor pads placed under your baby's mattress, it detects even very subtle movements and alerts you through the receiver. If your baby doesn't move for 20 seconds, or no micro-movements are detected for 10 seconds, the device will sound an alarm. This is the system for parents who are worried about SIDS, particularly in preterm babies. With all the dangers facing infants during their early stages of development, our testers noted that this was a great idea. They also noted that it worked quite well, but they weren't convinced that it was worth the high price. Instead, they said they would have opted for the Angelcare. We agree with this sentiment, but also point out that other parents noted that this system was more sensitive and reliable, and had fewer false alarms. So if you're looking for just a movement monitor, this is a great option. 7. Graco Secure Coverage Baby Monitor. At #7, this baby monitor has been on the market for about a decade, and has been improving over the years. 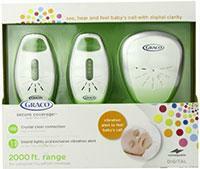 The Graco is the old standby, the classic and one of the most popular and reliable baby monitors on the market. It is one of the least expensive on the list, and has the simplest and easiest to use features. However, it is extremely hard to find lately, and that's the main reason it's at the bottom of our list. It also is limited to sound only - no temperature, movement, or anything fancy like the talk-back function. You can change the volume, mute it, and still see a lighted indication on it that tells you if any noises are being made. Like the Philips it uses encrypted digital transmission for sound clarity and security. And it has an excellent range. One of our parents commented that this Graco and the Angelcare were the only two that worked while they were far out in their back yard. The receiver unit recharges on a cradle and has a convenient belt clip for portability. Overall, this is an excellent, no-frills, reliable baby monitor that will last you for many years. But being no-frills, it has many fewer features than the other ones on our list. Hard to find.